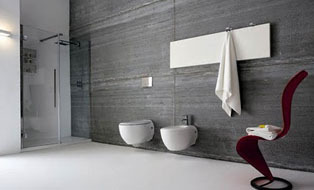 Many of today's bathrooms are very neutral or white. And why not? These are timeless colours that never date. However if you would like to stamp your personal style and add a splash of colour at the same time then there's a multitude of ways to do that. 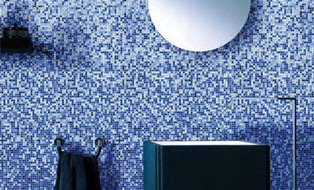 We can tile one or part of a wall a different colour to the rest of the bathroom, add feature tiles to break up the neutral colours or leave part of the wall untilled and use paint for that personal touch. Some of our clients still choose to go with the timeless neutral tones and add colour through soft furnishings and personal items like blinds, towels or floor rugs. Area rugs are great as they provide a barrier between your feet and the cold floor, provide colour, patters and texture. There are many types of woven rugs - including bamboo and wool, the oil found in the fiber naturally resists water. 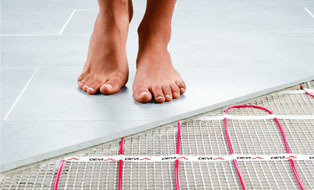 Comfort, comfort, comfort...... Undertile heating has several hidden benefits. 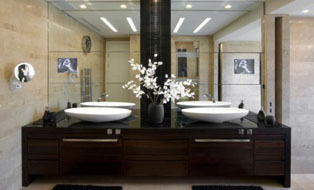 There is no ugly hardware in sight and the look, feel and atmosphere of the whole room is enhanced. No more dampness, wheezing heat pumps, draughts and condensation. Its no wonder radiant heating is recommended by health professionals as a treatment for asthma sufferers. Its efficient, practical and safe. 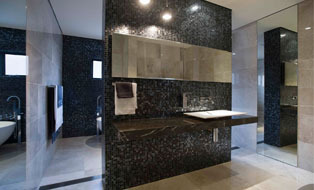 Perfect inclusion for any bathroom renovation in Canberra. 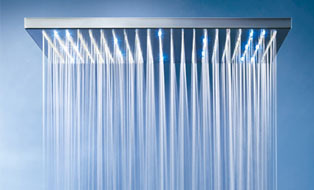 Modern contemporary shower heads can add a design factor to your bathroom. They create a luxurious full spray and unbeatable showering enjoyment sometimes likened to a rainfall effect that makes you feel like you are in a secluded, natural grotto. You will always be looking forward to taking a shower. 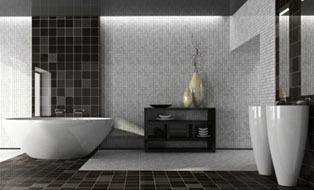 Choosing new tiles for your bathroom renovation is a very important decision. 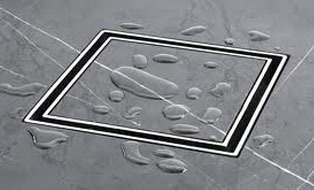 Bathrooms are generally very wet areas and so the tiling will often cover most of the room to ensure the area is clean and waterproof. Careful choices should therefore be made from both a practical and visual perspective. Sizing – different size tiles can have different effects on a room with larger tiles often creating a feeling of greater space. 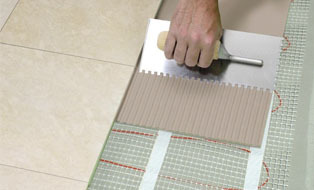 Bathroom tiles need to be the right size for laying around drainage areas. Patterns – using plain or patterned tiles and designs will be a personal choice in any room, but the type of pattern can often enhance a particular feature of your bathroom. 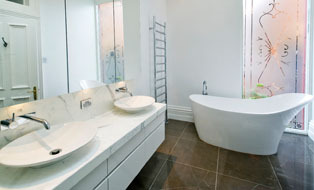 Bathroom tiles are also available in many styles, colours, sizes, textures and finishes. 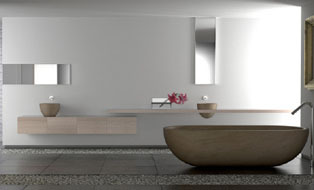 From ceramic, smooth porcelain to natural stone and glass mosaics, the options are endless when it comes to choosing the look and feel of your bathroom. 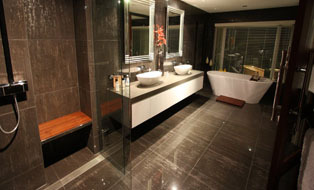 Creating Impressions bathroom renovations Canberra can assist you in choosing the right look for your bathroom. 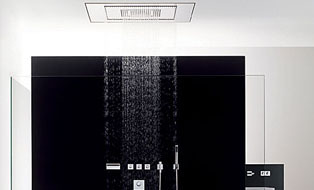 No matter its type, a bathroom shower can make a big statement or quietly enhance a room's overall design. 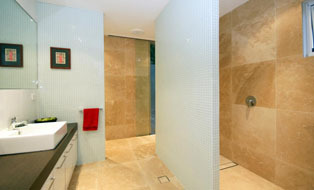 Take time to choose surfaces, add-on conveniences, and enclosures that create practical and personalized showers areas. Generally, doors and enclosures are made of clear, etched, or frosted glass that are either framed, semi frameless or fully frameless constructions. 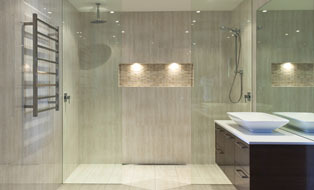 10 years ago a spa was critical in ensuites as a sales point of difference, however that trend is gone… if you have the room, a luxury shower enclosure for two should be a focal point. 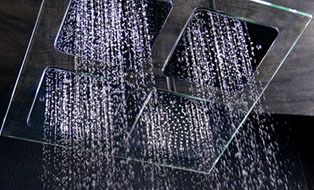 Double showers are becoming spa-like sanctuaries and are asked for in most luxury home designs. 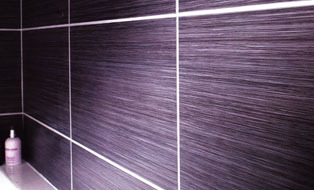 If you haven’t already seen shower recesses that are behind tiled walls rather than shower screens, get ready as this too is growing in popularity. Anyone who has cleaned a shower knows how frustrating it is trying to clean glass. 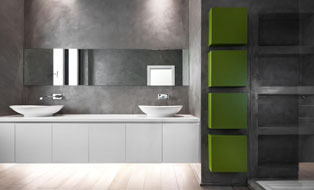 Shower shelves, shower inserts and shower seats are also very handy and practical! 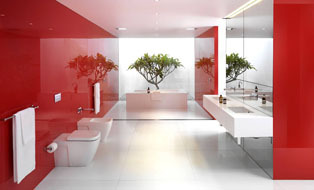 Add that wow-factor in your bathroom. Submerge yourself into pure luxury and melt away the challenges of the day. With a versatile designs, a freestanding bath adds an element of style and is the perfect way to finialise your renovation. 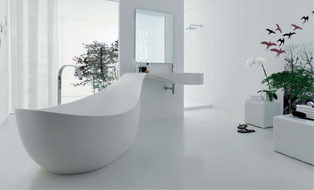 Available in an array of different shapes and sizes, the selection of freestanding baths will have you relaxing in next to no time. 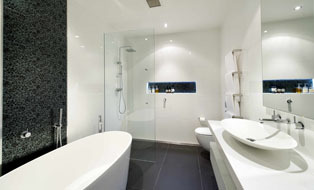 A well-placed bathroom mirror can make a tiny bathroom seem much larger than what it really is. While a wall of mirror is still very popular in bathrooms, more ornate bathroom mirrors are becoming fashionable as they are both functional and very stylish. 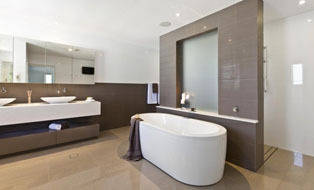 Do you have a question about our laundry renovations in Canberra? Would you like to book a quotation? Why not give us a call today?